The first book I read by Nestle was “Why Calories Count: From Science to Politics”, though I've read/heard her work referenced in countless sources. I think I first heard about her through Michael Pollan, another favorite non-plant based source of information. 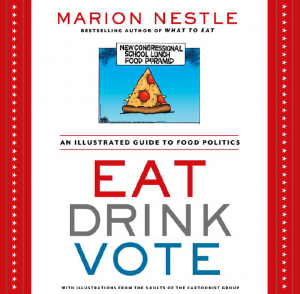 Nestle has a new book that came out in September 2013 titled “Eat, Drink, Vote” and I was lucky to read a copy from Net Galley. Let me start with this: I love this book. I read it quickly, it’s short and it’s fun. If I haven’t convinced you yet, let me go further. The book uses political cartoons from The Cartoonist Group syndicate to illustrate a variety of salient points about the US food system. Each page is a mix of cartoons and/or text. It’s amazing how cartoons can convey so much in such a small place. I read a lot of nutrition books and articles, and this one was unique in presentation but didn't give up anything in the way of hard knowledge. I think it’s so important to use humor to express sensitive issues because it allows us to examine them in a way that’s not threatening, and we often have a more visceral response to images than to blocks of text. This book is a nice primer on the US food system and covers topics such as: agriculture, politics, food marketing, hunger, international relations, government intervention, obesity, nutrition research, cultural values, and more. I’m so impressed by it that I’m going to order it for my library. It’s a good example of how to use media to support scientific information, and touches on many different disciplines. Do yourself a favor and read this book. It’s easy to get through, will elicit a few laughs, and will quickly educate you on the most important topics in food politics.